If you don't live in the Deep South, you probably thought the luscious kiwi fruit was beyond your grasp --- I know I did. Enter the Hardy Kiwi (Actinia arguta), whose vigorous vines will ripen fruits up to zone 4. The Hardy Kiwi originated in China, where it grows naturally in humid mountain forests that share so many species with our own Appalachian mountains. Asian people have eaten kiwis for centuries, and in 1983, 130,000 tons of kiwi fruit were harvested from wild vines of several kiwi species in China alone. 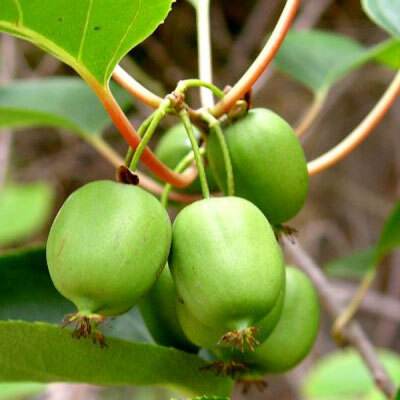 Hardy Kiwi produces fruits that taste very similar to the kiwi fruits that you buy in the store (from Actinidia deliciosa), but they are much smaller and are hairless. My understanding is that you pop Hardy Kiwis in your mouth like grapes, and can also store them in root-cellar-like conditions (just above freezing and at 95% humidity) for nine months. Since one plant can produce up to 100 pounds of fruit, you might be able to provide your winter dessert with just a few vines. Where should I plant my Hardy Kiwi? Hardy Kiwis are sensitive to late spring frosts, so they are best planted on north-facing slopes where they are shaded from early spring sun. Provide well-drained soil (or plant on mounds), and build a strong trellis to support the plants. Kiwis should be at least 15 to 20 feet apart. Do I need more than one plant? Since Hardy Kiwis have separate male and female plants, you will need to provide at least one of each to produce fruit. Only one male is necessary for each eight female plants, as long as the female plants are within 35 feet of the male. How do I train and prune my Hardy Kiwi? The initial training is a lot like training a young grape vine. During the first year, develop a trunk by training the strongest shoot up along a one to two inch thick pole, cutting away all other shoots. 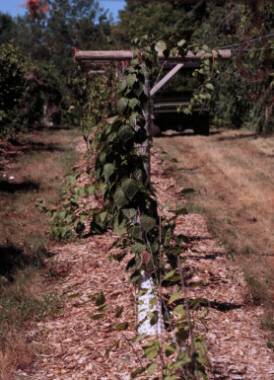 When the trunk reaches the lowest trellis wire, split it into two cordons by training one arm along the trellis in each direction. Once cordons are seven feet long, cut them back to that length each winter and develop fruiting arms at one foot intervals along the cordon. At the same time that you cut back the cordons, prune fruiting arms to eight buds beyond where they fruited last year. How do I propagate the Hardy Kiwi? If you want to perpetuate the same variety, take cuttings. Hardwood cuttings work, but softwood cuttings root even more easily when taken from new growth in early summer, removing the tips and clipping leaves in half. Softwood cuttings will root in two to four weeks. Hardy Kiwis can also be propagated from seed (although you will end up with more variable offspring, half of which will be male.) To grow them from seed, put the whole fruits in a blender with some water just long enough to create a mush, then sow the pulp and seeds together, stratifying for two months. Hardy Kiwis bear at two years from cuttings and at three to four years from seed. When do I harvest the fruits? 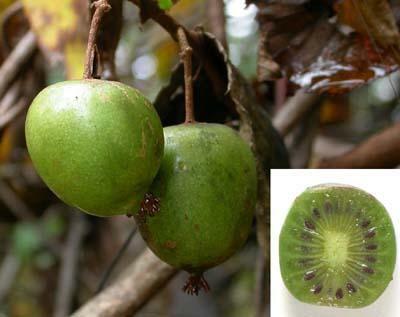 Hardy Kiwi fruits are ready to be picked when the seeds are black, even though the fruits are still hard. Allow them to soften for a week at room temperature. Why is the Hardy Kiwi a permaculture favorite? Permaculture admonishes us to grow plants that are well-suited to our environment and don't require lots of sprays and babying. The Hardy Kiwi fits a niche very similar to a grape, but seems to have no diseases or pests (beyond Japanese Beetles) in the U.S.
Are you growing them? We planted two females (Dunbarton Oaks and Ananasnya) and a male in fall of 2008. They sulked for the first year, but I hope they'll take off this year --- I'll keep you posted. Check out our microbusiness ebook, full of tips for creating a job that won't take over your life. I bought 3 kiwi plants when I was a kid. Got them from tripple brook farms in mass. and planted them in Ct. We had a drought the first year, and it killed off my male plant and my female plant. The perfect plant survived but did poorly for two years, until my parrot died and I buried her at the roots of the plant. At that point the plant took off like gangbusters. Unfortunately I really never got fruit from the plant except for the one year I went in with a paintbrush and cross pollinated the flowers by hand. The plant is huge now, 14 years after planting but, with only a single plant there is no fruiting. Apparently you really need several males and we dont have natural pollinators (or many natural enemies) in the US so all pollination is wind born. If you really are in a windless valley, you may never have much luck or you may have to hand pollinate. Here's wishing you better luck than I had. When I was researching hardy kiwis, I was interested at first in the perfect plants. But then I dug a little deeper and read that they're much punier than the imperfect versions and give much less fruit. That's why I ponied up the extra cash for a male and two females --- hopefully they'll indeed be much more prolific than your perfect plant. I'm not worried about pollination --- those flowers look very much like they're insect pollinated, and we have plenty of pollinating insects. (There are over a hundred buzzing around the peach tree as I type... ) Of course, I won't really know for a couple of years! Considering how much healthier my plant was after I buried my pet underneath it, you might try burying some chicken bones near the roots of your vines. Rebecca --- good idea! I wonder if it's the calcium from the bones or the burst of organic matter they enjoyed? Roland --- I finally got a chance to read that article you suggested. (Busy day today!) It was wonderful!!!!!!! So similar to all of the things I've been trying, like permanent beds, forest gardening, and no-till farming. I wish I could find a tree that dropped its leaves just as the planting season begins around here. Drat --- I think I accidentally deleted someone's comment asking if they could graft a fuzzy kiwi onto a hardy kiwi to make the former more likely to survive in cold weather. Unfortunately, I don't have an answer to that. Maybe someone else will stop by and give some feedback? My attempt to propagate using a softwood cutting has met with some surprising results. For about two months, I've had a cutting sitting in water. Leaves were clipped as suggested in the article. The leaves are still as green as the day they were cut, but there are no roots! I previously tried hardwood cuttings in a vermiculite mix using rooting hormone, but they just rotted. Dan --- Hmmm... There are a lot of factors involved in making a softwood cutting root. What might be most relevant is time of year. Softwood cuttings are often taken in late spring, at which time I assume the plant's hormones are a bit different than at this time of year. So maybe you'd be better off trying again in June? They will tear a small kiwi vine out of its pot. Felines seem to think it is a new sort of catnip (Not just domestic cats either-big ones like it too). They go crazy, so cage the plants well until they are too big to uproot. Has anyone had experience with rabbits and kiwi vines? Obviously, the vines will be fine once the stems get thick and they get up to regular height, but I'm planting new ones, which will be well within chewing range for a while.